It started off with the “core four”. A wonderful team of four fantastic characters and stories which, for the most part, always involved all team members solving one interesting case each week. After season one, several attempts were made to add a fifth member to the team, with very little success, until the wonderful presence of Chi McBride and the introduction of Lou Grover. The “core five” became six and then seven with Jerry and Adam joining the team in recent years. Do we really need seven full time team members? I know many of you asked that question because I did as well. It’s true that having such a big ensemble cast means less screen time for each individual character and, of course, that includes my beloved McDanno scenes, unfortunately. While I fully support the reasons behind the larger cast and the flexibility it affords regarding lighter and less physically challenging work schedules for the more senior members of the cast, story wise, it doesn’t always work as well as it should. Then there are episodes like this one. Which was absolutely fantastic. I admit, there was a major eyeroll from me when I first read the synopsis for this episode. “Augh! Another multiple story episode!” And it did have five ….. yes…. five stories. But, the main character wasn’t any one person or persons in different stories, but a .38 caliber “community” handgun that played an integral part in every story. Paul Grellong crafted an excellent script which blended those five stories into a wonderful single-story crime of the week revolving (pun intended) around that gun! He was able to give every member of the team something important to contribute so no one was left by the wayside and no silly secondary story was needed just to give everyone something to do. All energy and talent was focused on one case while still telling multiple stories. It wasn’t until the very end when Danny and Tani and Steve and Duke paired off chasing the culprits of their individual past stories. Grellong’s script was masterful. As was the direction of David Straiton. It was inventive and extremely well executed. The way he seamlessly moved between the stories, and the editing of those scenes, was flawless. By not having the scenes simply stop and start, timeline to timeline, in the way we’re used to seeing but having them superimposed on each other was highly effective. It not only smoothly moved the stories along, it made them all feel even more connected when several times characters from different timelines were on the screen simultaneously. It was so well done it was extremely easy to follow which, considering the number of stories happening all at the same time, is a remarkable accomplishment. This episode will go down as one of my all-time favorites of the series. The provenance of the .38 was beautifully intertwined with the destiny of all those involved. Junior, in a call back to the time he was living in the homeless shelter before Steve took him into Casa McG. Tani and her relationship with Damien, the evidence she supplied to HPD, her desire to keep Koa away from that life and her ultimate decision to join HPD herself. Danny and the convenience store holdup on the night he arrived in Hawaii, before he even had his first day at HPD. And, of course, Steve, John and Duke, the most unexpected and meaningful story of them all. I really enjoyed all the flashbacks in this episode. When I first read the episode synopsis, I was surprised they were going with flashbacks yet again. I feel like we’ve had one or more in like every other episode this season. But these were absolutely wonderful. It made the crime of the week seem secondary to the history we learned about the gun and how it touched the lives of our team. I’m really enjoying how we’re getting to know more about Junior and Tani this season, starting with Junior and his dad and in this episode, more about what lead Tani to join HPD. Of course, we knew about Tani’s relationship with Damien from Episode 8.12 (Ka Hopu Nui ‘Ana – The Round Up). It makes you wonder why, in 2015, Tani would have gotten involved with Damien in the first place because we can see she not only wanted Koa far away from Damien’s business, she clearly had a well-established sense of right and wrong when she turns Damien’s henchman Maleko over to HPD for murder. A murder committed by that community .38. Five years earlier, in 2010, on his very first night in Hawaii, Danny heads into a convenience store looking for a bite to eat. I had to laugh at his reaction to the spam musubi and his desire to find something that “comes from a cow, maybe?” I agree with Danny about the spam musubi. Having tried it myself it’s not one of my favorite things either. It was great to see Danny in “Pilot mode” again. I loved that, in usual Danny fashion, we see him on the phone with Gracie, looking forward to seeing her the next day and sending his love to his precious “monkey”. And ohhhhhhh, I do so miss the tie!! It seems Danny has a lot of nerve calling Steve a “danger magnet” considering on his very first night on the island, he’s involved in a holdup which resulted in a murder. A murder committed by that community .38. Twenty-seven years earlier, in 1983, John McGarrett receives a mysterious phone call, taking him away from his pregnant wife Doris and six-year-old Stevie. Scott Hester, a man John helped put away ten years previously and who blames him for ruining his life has lured John to a remote area in order to exact his revenge by killing him. He’s done so by also luring HPD to the area by killing a boar and leaving it in the road. When HPD arrives, Hester kills one officer (a murder committed, once again, by that community .38, which incidentally Hester also used in the murder ten years prior). He then forces the other officer to make that phone call to John. Who else’s heart literally stopped when Hester pulled the trigger on both John and the officer? Thankfully, John had the foresight to wear a vest, but the fallen officer wasn’t as lucky. It was a genuine “Oh my God” moment when John came to the officer’s aid to find that it was our own beloved Duke Lukela. Now that was a twist I never expected! I was so happy they got Ryan Bittle to play John McGarrett again. He did a fantastic job in Episode 8.19 (Aohe Mea Make I Ka Hewa; Make No I Ka Mihi Ole – No one Has Ever Died for the Mistakes He Has Made; Only Because He Didn’t Repent), which incidentally was shown almost exactly one year ago to the day on April 6, 2018. It was great they got him to play John again and that we had the chance to see the McGarrett household fully intact. In the past we’ve seen John or Doris with Steve at various ages, but we’ve never seen them all together. It was a charming and yet simultaneously heartbreaking glimpse of the family that would one day be ripped apart by betrayal and lies. And how fantastic was it to see Dennis Chun get such meaty scenes from this story. The scene between Steve and Duke in Steve’s office talking about the night John saved Duke’s life was fantastic. You would think after all this time, Duke might have mentioned to Steve that his father saved Duke’s life but Duke did say that he and John never spoke of it after it happened so perhaps Duke just never thought to bring it up. It’s not really the kind of thing that comes up in casual conversation, after all. I loved when Duke and Steve took off to track down Hester in California. Watching the two of them together was absolutely golden. I also really enjoyed that Duke took Hester down with a shot to the leg, instead of killing him outright. It gave us a fantastic face to face showdown between the two men, again with the wonderful direction of David Straiton flashing the camera from current Hester to current Duke, to young Hester to young Duke and back again. And that little headshake from Steve which literally silently yelled “Duke… don’t do it!”. When Duke introduced Hester to “John McGarrett’s son” then asked him if he remembered him… it was chilling! It was all masterfully done! Of course, no episode is 100% perfect even if this one came pretty damn close. Lest I be accused of seeing only the good through my rose-colored glasses, I’ll point out this teeeeny flaw. There was an error in Danny’s time line. In the Pilot of the series, Steve goes to Danny’s apartment to conscript him into being his partner in his quest for Victor Hess. Steve mentions that Danny’s captain told him that Danny transferred to HPD “6 months ago”. However, the incident report from what Danny called his first night on the island is dated August 22, 2010. As we all know, John McGarrett was murdered by Victor Hess on September 20, 2010, which is obviously, not 6 months after August 22nd. But, you know what? Who really cares? In the full scheme of things, this episode was incredible from start to finish. It gave us one great crime of the week that managed to weave four additional stories into the whole without diminishing a damn thing. And it gave the entire seven-member team great scene time. And we managed to learn more about each of the characters involved in the stories. Yes, indeed. This one will go down as one of my favorites of the entire series. That’s it for this week my friends! Looks like the weather here on the East Coast is finally going to let Spring have her way. I hope you all have a wonderful week full of sunshine and warmth! Aloha. Malama Pono. Screen caps are mine unless otherwise noted! Great review as usual, Linda! It was incredible to see how one gun could affect so many lives,albeit at different times. My favorite part had to do with John, Steve & Duke-the gun affected all three of them at pretty much the same time,although Steve didn’t realize it until years later. I loved the last scene involving the younger and older characters of Duke & Hester-an awesome job of acting and directing! 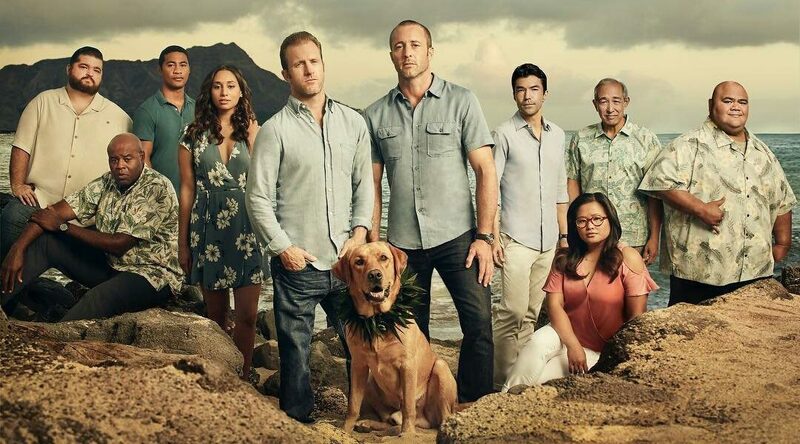 I thought there was something off about the timeline of Danny coming to Hawaii and when he joined HPD,but as you say, the episode was so good you can let that pass.Looking forward to the next episode! I agree Rhonda! I have to remind myself that those of us who have watched every episode of this show dozens of times know every little detail minutely! We’re going to recognize things because of the sheer repetition. Thank you! What a fantastic review for a great episode, one of my favorites too! Great review. Really however want to see more Danny and Steve time. That has been missing in seasons. Or Steve and Lou. 8/10! Great review Linda! This episode was perfection! The seamless transition from past to present was masterfully done. I never thought of it as 5 different storylines but just one. It’s always great getting glimpses into our favorite elite task forces pasts. One thing that surprised me was Danny wearing a Mets hat. I could’ve sworn he was a Yankee/Jets fan. But I could be very wrong. Any insight on that? I loved the ending. Steve moves me to tears on a regular basis and his conversation with Duke was no exception. I love that he is able to get more information and closure on his father. He speaks volumes without saying a word but with only a blink, expression or nod of his head. The writers did a great job on making a gun the star of the show and intertwining the lives of so many because of it. Happy finally Spring! Have a great week!! Yankees fans have been Yankees fans for generations. They pick up new fans, of course, as the decades go by but many are generational fans going way back. When the National League Giants and Dodgers left New York in 1957 those National League fans were left adrift. They could never bring themselves to root for the dreaded Damn Yankees so they, for the most part, went to the only game in town for them when the Mets came along in 1962. Yeah, back in season 1 Danny told Steve about going to Yankee games as a kid (while Steve and his dad hiked through jungles looking for images carved in stone LOL) but my mind goes back to episode 4.19, when trapped under the collapsed building, Danny managed his claustrophobia by reciting Mets lineups. I did forget about that episode even though I’m a Met’s fan and I recited that lineup with him!! Just another little inconsistency to ovelook. I really enjoyed this episode. Loved how the flashbacks were timed. Ryan Bittle is superb as John. Did anyone else notice that when John was talking to Doris, the camera was on young Steve and he raised his eyebrows exactly like Alex/Steve does? I’m wondering if that was planned? Such a great story, especially for Steve and Duke. So touching. After feeling less than stellar vibes the last few episodes – I’m relieved they seem to be back on track. This was a good story, well put together with interesting twists that had everyone involved in ways that made sense. I liked how they wove it together. Not enough Steve & Danny time, but loved seeing Danny with that big gun. Nice ty.in to Steve’s dad. I am glad they’re finding ways to involve Duke. Excellent review, Linda. And yeah, never enough Steve & Danny time and definitely too many characters on the H50 canvas. I understand the reasons but still don’t have to like it nor do I think it’s necessary to the degree that we see on a regular basis. However, I don’t want to complain here b/c this was, indeed, a very well done episode that utilized everyone pretty darn well. I almost didn’t see the flashbacks as such…I felt like I was observing timelines almost simultaneously because it was so fluid and easy. I thought the same about Danny taking those chances that night but figured, hey, it was probably instinctual (b/c we’ve seen him in his BAMF moments) and maybe even served to remind him later that he WAS taking a big chance, especially since he couldn’t even pronounce where he was (now THAT was funny). The Steve and Duke piece was quite poetic and it was great to see it all come full circle. Now I’m just looking forward to the next ep where we actually see Danny and Steve together and laughing. I have to agree that seven full time team members is a bit too much but since I adore every one of the actors playing those parts and I actually like all the characters a lot, I’m ok with it. Yeah, I will always prefer to have Steve and Danny, together, front and center 90% of the time, but I know I can’t have that anymore. So I’m happy with what I can get and try my best to enjoy it. Oh yeah… I loved how Danny couldn’t pronounce the street names! That was hysterical. I also loved this episode. Is it just me or did Danny look adorable in a baseball cap. I loved his tie and his baseball cap. He is just so adorable. But, really, I loved the whole episode. I love how Tani is so protective of her brother. She is always looking out for him. The only thing is that it was a little short on McDanno. But that’s okay. They have to mix it up once in awhile. It showed how Steve started to appreciate what his dad did. That’s maybe what led him to become a Navy Seal and later a cop. Well, thank you for the great review. Looks like next week will be another good one. I’ll see you all then.
. One of the things that I love and respect about H5-0 is how well it shows the dedication that the task force and indeed the HPD have for each other. How they watch each others backs. John Mc Garrett with young Duke and Steve making sure that the present day Duke didn’t cross the line and take revenge himself That wonderful little headshake of Steve’s.!!! !The whole cast was amazing Present day and Flashback Danny were So good. Kudos to Scott!!! My son is a CHP officer working close to Riverside California. Yesterday we lost one of our own to a drunk driver 2.5 times over the limit at 4.30 in the afternoon. The officer who was killed helped to train my boy and mentored him and many other recruits who are now serving proudly. Paul spent the day on duty with the family and will be attending the funeral. This is what law enforcement is and does. I’m so sorry about your son’s colleague. I’ve never personally known a fallen law enforcement officer but I’ve seen far too many funerals of fallen officers in my city over the years. It’s always so touching as well as heartbreaking to see all the officers, many from other cities around the country, lined up to pay tribute to the fallen officer. It’s always incredibly moving to witness. Sorry to hear this. My husband is a retired police officer. I never stopped worrying about him until he turned in his shield. Peace to your son and the family of his mentor. Thank you so much.Thank your husband for his service. I loved the episode. I liked how the history of the gun was told. Reminds me of a book that Paulsen wrote called the Rifle, it tells a history of rifle, anyway I like how everyone help to move the story along. Steve has been wearing more striped shirts lately. LOL!!! I love how this show is willing to tell different types of stories and use different styles of storytelling to keep the show fresh and unique. Of course, the idea of following the history of a community gun has been done before, but using it as a way to tie together some of the team in more intimate ways was really well thought out and executed by the writers, director and actors. A little bit of an origin story for Steve, Danny and Tani, all wrapped around one gun on the streets for 40 years! I’m completely impressed and amazed at the ability of this show to remain exciting and satisfying nine seasons in! I totally agree Lynnette! It would be so easy to just lay back and rehash similar stories and play it safe. It’s so much more fun when the creators behind a show are willing to stretch the canvas a bit and, as you say, remain exciting and in this case captivating by tying an old case of John’s, Steve, Danny and Tani and the current case to the same gun over 46 years!